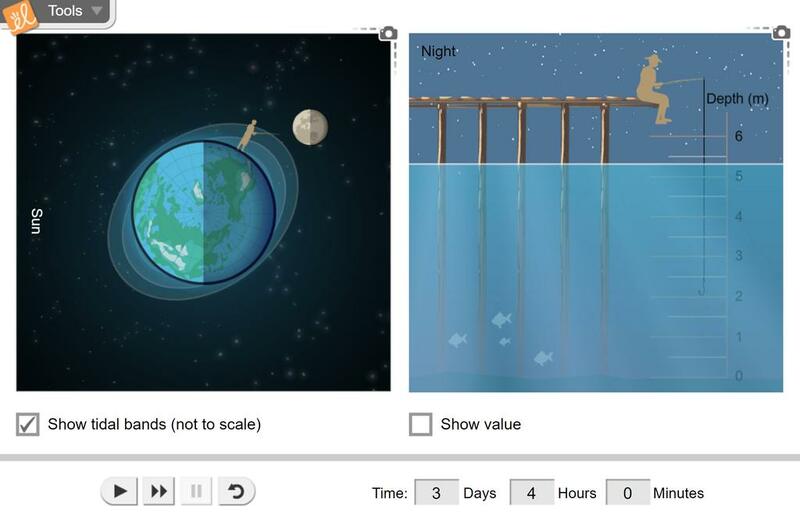 Develop an understanding of ocean tides by comparing the depth of water near a dock to the positions of the Moon, Sun, and Earth. Determine the influence of the Moon and Sun on tides, and compare spring tides to neap tides. Determine the effect of the Moon on tides. Identify spring and neap tides. Interpret the effect of the Sun on tides. Analyze data using a chart. To determine when high and low and spring and neap tides occur in different areas. To determine when high and low tides occur and Spring and Neap tides occur in different coastal areas. Some quick questions to gauge student understanding of ocean tides.